WARNING! This episode may result in gold fever. 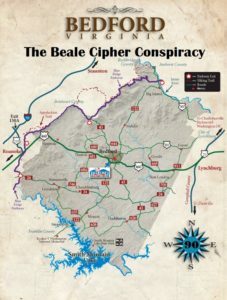 On this week’s episode, Brett and Amy take you on a hike to the Blue Ridge Mountains of Virginia to investigate the Beale Cipher Conspiracy of Bedford, sandwiched between Lynchburg and Roanoke. Travel with us as we search in a “place that sells itself”. What is the historical link between Bedford and Normandy? Besides the history, we also discuss the beauty and activities that are a huge draw for the modern traveler. From beautiful hiking trails and outdoor activities to the music and local cultural activities. This town has a lot going on today, but a lot of people visit for a completely different reason…GOLD. We discuss the treasure legend and conspiracies around the Beale Cipher. From the history of the Beale papers to the history of the people who have searched in vain for the treasure, we cover it all. We definitely know exactly where the treasure is hidden and we are blowin’ the lid off of this mystery….except for maybe, where the treasure is located. The treasure is only estimated to be worth 63 million dollars in today’s money, so you may only have enough to share with us….just sayin’. We also discuss Thomas Jefferson’s Poplar Forest. It is really the most popular poplar forest ever. No Episode of the Travel Oddities Podcast would be complete without a place to grab a bite, and we found a restaurant steeped in travel history. Olde Liberty Station is THE restaurant to go to in Bedford, and it is an honest to goodness restored railroad station. Amy has been writing the defense against the dark arts segment again…so there will be discussion around bug spray. The Top 5 has apparently been named the most important part of the show….so we included it.